“The potential for water savings in the EU is estimated at 40%. Binding rules could be envisaged to promote water savings in public and private buildings,” states the EU executive in its work programme for 2010. The EU’s Water Framework Directive (WFD) already requires member states to introduce water-pricing policies with incentives for efficient water use, but the directive does not set standards for consumer products or otherwise address water demand management issues. Environment Commissioner Janez Potočnik said earlier this year that the EU had not yet looked closely enough at demand-side measures like water pricing and efficiency. The drive to address water efficiency in buildings follows on from the Commission’s 2007 Communication on Water Scarcity and Droughts, which considered a series of legislative measures such as the inclusion of water efficiency criteria in performance standards for buildings. It also suggested adding taps, showers and other water-using devices to the scope of the EU’s Eco-design Directive, which sets standards for energy use. Labelling schemes would also be extended to promote water-saving devices to consumers. A study commissioned by the EU executive and published in August 2007 estimates that water efficiency could be improved by nearly 40% via technological improvements alone, and that changes in human behaviour or production patterns could increase those savings further. The report further claims that a number of specific technological and technical changes to taps, toilets, showers and water-using equipment such as dishwashers can reduce water demand and result in water savings of up to 80%. According to the report, only a few member states have already included water-saving standards in national building regulations. 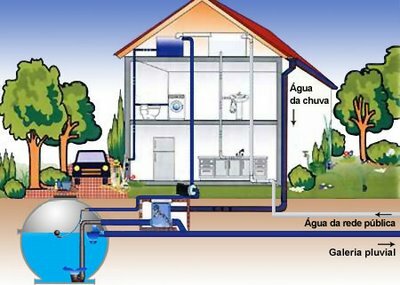 A Commission official told EurActiv that water efficiency in buildings is also about reusing grey water (roof water) to flush toilets or water gardens. Use of grey water can reduce the strain on rivers and lakes and thus help to save water in general, the official explained. According to the Commission study, harvesting rainwater could meet up to 80% of the household needs of a typical family house in southern France. However, the report notes that installing such grey water systems “requires a certain level of behavioural change to adapt to these new systems. Whilst these are suitable for new build, such systems are less feasible for existing buildings due to the cost and difficulties of retrofitting”. As for reusing waste water, the report notes that this requires large investment for treatment and that these “may inhibit the development of direct domestic water use”. Retrofitting of older buildings is also considered relatively difficult.